Temperatures are dropping outside and school activities are rising. Being a large urban district means that there is always a lot going on. I’m going to try and hit as much of it as possible. Lord knows I’ll probably forget a few things though. My day began over at Maplewood HS with the years first Project Lit community book club meeting. In case you are not familiar, Project Lit was started by students at Maplewood HS and their teacher Jared Amato. Last September he presented an article about book deserts and challenged them to come up with ways to combat the issue. What resulted was a true Project Based Learning effort. Students started by designing a plan to address the lack of books in their neighborhood. 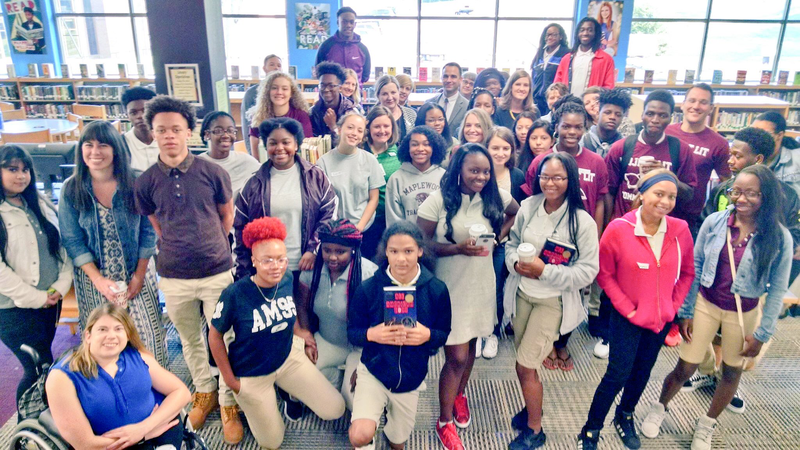 The book club grew out of their success in creating a book drive. Each month a YA title is chosen and community members are invited to read the book and come discuss it in student facilitated groups. This month the book was American Boys, a story centered around a police beating of a young Africa-American male told through the eyes of the African-American boy and a white boy who witnessed the event. I joined a group that consisted of 5 AA young men and Tara Scarlett, who was gracious enough to attend. Listening to these young men talk was quite informative. So often we think that we can predict people’s thoughts and feelings, but when we talk to them we find that people are much more complex creatures then we give them credit for being. I’m extremely grateful for the willingness of these young men and Tara to share their thoughts with me this morning. Next month the book is The Hate U Give. The Maplewood book club meets will meet on October 20th. However, one of the great things about Project Lit is that other schools are starting to open chapters – pun intended. Croft MS’s Project Lit book club will hold it’s second meeting on September 21st at 7:30 AM. The book will be Towers Falling. Do yourself a favor, get cracking reading, and show up on the 21st. On Monday I introduced you to a brand new consultant group that would be securing substitutes for 24 of our district schools. In keeping with the spirit, let me introduce another new player to the field, Concentric Education Solutions. Concentric is a company out of Maryland – I know you are shocked – publicly endorsed by our number 2 man, Sito Narcisse. We are paying Concentric $98K to conduct home visits in 4 priority schools. 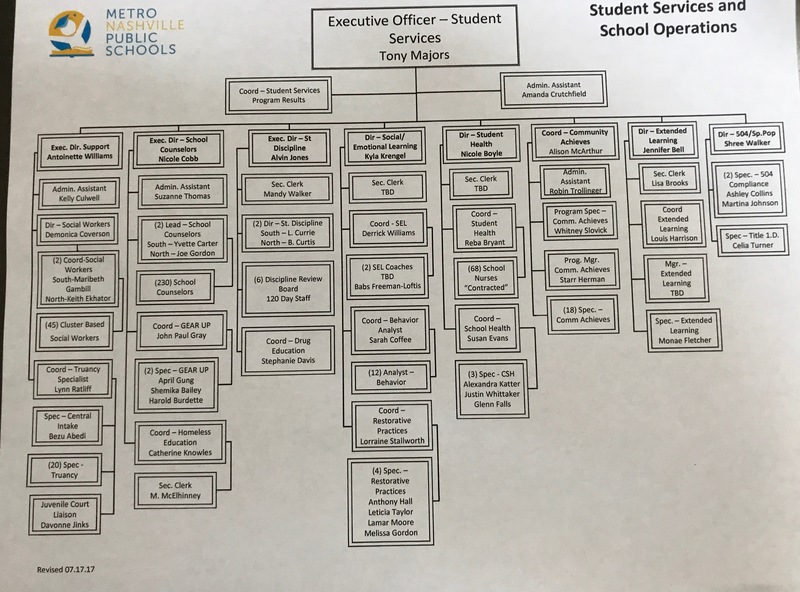 You might be scratching your head right now thinking, “Don’t we already have a department for that kind of thing?” Indeed we do, it’s called the Student Services and School Operations. SSSO is one of the largest shops in MNPS and it’s chock full of councilors, social workers, family engagement specialists and the like. You know, people that would be good at conducting home visits. They are not part of this though. 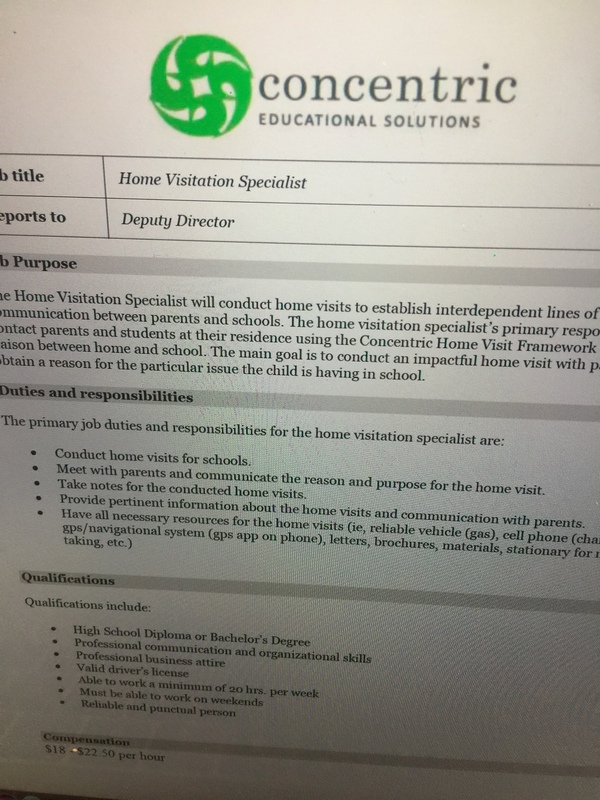 This is being run through the priority school office and executive director LeTricia Gloster whom, hold on to your seat, is also from Maryland. Just so you understand how this works, the priority school office is engaging a company from their home state to manage 1099 employees from Nashville to go into the homes of families from 4 priority schools – Joelton MS, Jere-Baxter MS, Madison Middle, Napier ES – whose children have been flagged for attendance issues.Thinking that sounds like a neat job and you wonder if you are qualified? All you need is a HS or Bachelor Degree, business attire, and a cell phone with a GPS apps and you could be doing the work of professionals. Anybody see any problems here? 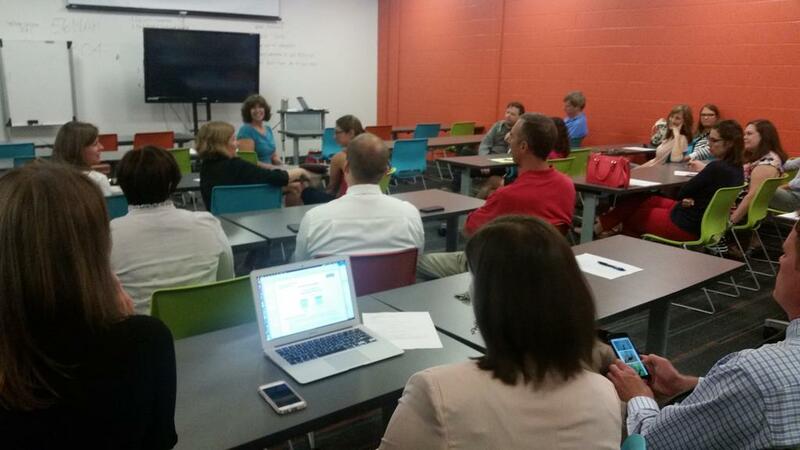 How about access to student data? What happens when this pilot grows? What are the ramification on the department of SSSO if the pilot grows? How do we measure whether Concentric is successful or whether they are benefiting from the work of MNPS’s social workers and family engagement specialists who are already doing the work? 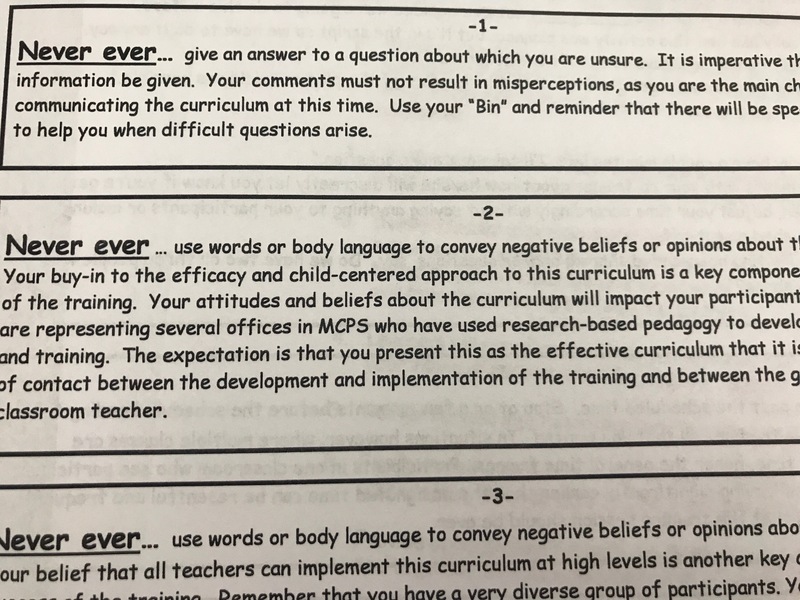 Is anybody coordinating to make sure that both MNPS and Concentric are communicating the same message when interacting with the public? Is there no other company in the country doing this kind of work and if there is, why did we not engage a company with roots in Tennessee or the very least the south? I could go on, but I’ll let you come up with your own questions. Wednesday saw President Trump make, in my opinion, a horrible decision to retract protections for our undocumented students by repealing the Deferred Action for Childhood Arrivals (DACA) act. The possible repercussions of this action could impact nearly half of the students at my kids school, including many of their personal friends. For my family, and for the teacher’s and other families across the district, this is not a hypothetical exercise but a very real crisis. MNPS released a strongly worded public statement rebuking the action. While I certainly support the sentiment of the statement, I’m always hesitant of the district taking a political position. First of all it sets precedent. 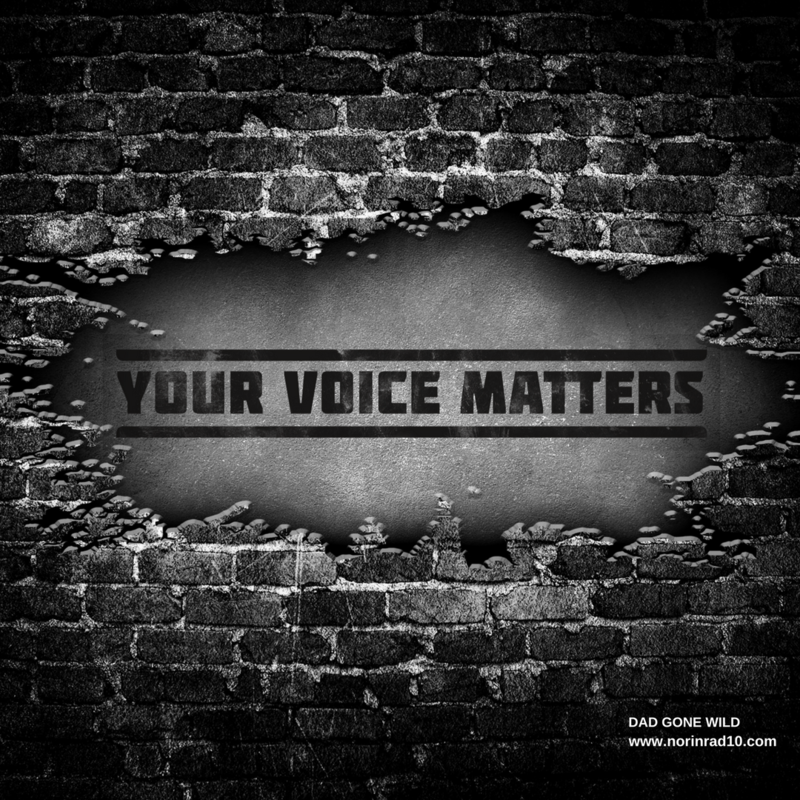 Eventually there will be an administration that does not share my values and an issue that I may support will come up and they will release a statement voicing opposition. How will that make me feel? They will use this to defend that. Like it or not, Trump is President because enough people who agree with his policies voted for him and many of them send their kids to MNPS. I think a public institution must be very careful that it always remains neutral. Advocating for children is one thing, staking out a political position is another. Does this statement do the former and not the later? I don’t know. The second issue that always gets me is that the district is forever willing to make bold political statements for our EL kids but fails to back them up when the cameras fade. Most of these kids are still housed in inadequate facilities. ELL funding was not increased at all this year despite the excellent work being done by the department. The district continues to explore turning over responsibility for some of our newcomers to a charter school overseen by people with good intentions but no where near the qualifications of MNPS’s EL department. Imagine the reaction if the district considered turning a portion of the their special education kids over to a charter school with no proven track record in special education, merely a passion for it. So rather than issue an overt political statement, I would prefer to see the district put some walk in its talk and really step up their game in meeting our immigrant children’s needs..
Tennessee Achievement School District Superintendent Malika Anderson submitted her resignation this week. I can’t say that I was surprised to hear it. Anderson is someone who I philosophically disagreed with but I can confirm that she did not have two horns on her head, nor a pointy tail. I found her to be very passionate and I do hope she doesn’t leave education. Over the past couple of years I’ve become very conscious of our inclination to try and run people out of the conversation instead of getting more people into the conversation. Know and honor the history of the communities that you are serving. There is a hell of a lot of good there, right? And there are warriors who have been fighting this battle on behalf of their kids for generations that should be included instead of us coming in as white knight to save the day. Gary Rubinstein, a NJ blogger who has always covered the ASD better than anyone, has two great catches in a recent blog piece. He notes that with Anderson’s departure no one is left from when the ASD was originally created with the goal of moving the bottom 5% into the top 25% with in 5 years. A goal that was ridiculed at the time and one that the ASD has dramatically failed to reach. The second point is that Anderson had become a Chief for Change. I failed to catch that one. I knew that State Superintendent Candice McQueen had accepted membership but not Anderson. I’d be a little worried if I was McQueen because it seems that failure is a pre-requisite for joining the Chiefs. The Tennessean has a interesting article today on the financial crunch facing Williamson County Schools. Seems people move to WC for the excellent schools and the low property taxes. It looks like one of those is going to have to give. Here’s a fun little game to play. To the left is a hand out given to literacy coaches at this weeks meeting. Can you spot the grammatical error? Sigh…freudian slip? This week 33 Nashville Council members signed a letter supporting MNPS School Board in their Data Wars. My only question is, where were these 33 when MNPS children were exposed to lead in the drinking water? SSSShhhhh TC…stop talking about that! As always, TNED Report’s Andy Spears explores things a little deeper. The Overton PAC meeting that was scheduled for next week has been rescheduled to Monday September 25th at 6:30 at Tusculum ES library. All are welcome. The Hillsboro PAC kept right on going last year and we are hoping to emulate their success. The Country Music Hall of Fame is now offering free admission to all Davidson County kids under 18. 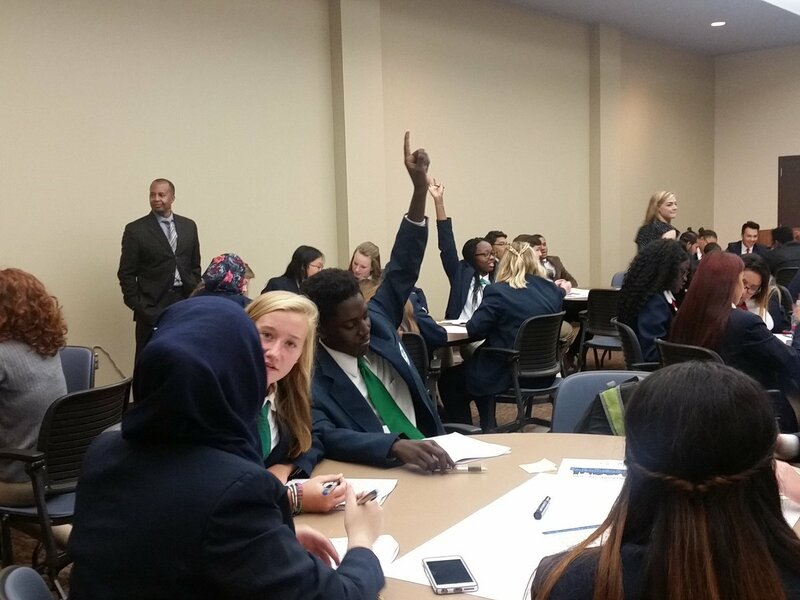 More than 250 High School students participated in alumni led Ambassador training this week. Even though we are not supposed to look at recently released ACT scores yet, the rumor I’m hearing is that Metro Nashville Virtual School blew the doors off. Local blogger Vesia Hawkins has a post out this week in which she encourages parents to not get distracted by shiny objects and to instead stay focused on what matters, your child’s achievement. I encourage you to read the whole piece. I try not to read too much into things but coupled with Sharon Gentry’s remarks on the board floor last month…I think a message is being sent. Has anybody seen that definition of equity that MNPS is using? Surely after 13 months they’ve written it somewhere right? Since once you are one of us you are always one of us, Dr. Bryan Johnson has identified his transition team. Nice to see that it has some parents on it and far as I can tell nobody from out of state. His areas of focus seem solid as well. This week, as always, I’ve got questions. The first one involves MNPS’s statement on DACA. Do think it went too far? Not far enough? What are your thoughts? The second question relates to the hiring of consultants. Since the district seems to endorse outsourcing as much work as possible, what else do you you think should be outsourced? Last question relates to the job opening at the ASD. They need a leader and Dad Gone Wild knows people, so who do you think should be the next head of the TN ASD? That’s a wrap for the week. May your football team win this week, unless of course they are playing my football team. If you’d like to send me a comment please do at norinrad10@yahoo.com. Check out the Dad Gone Wild Facebook page. Please do not credit Ed post in any way. This is an astro-turfing organization designed to privatize education. Sure. But can you tell me how massive outsourcing and hiring an army of consultants isn’t actually privatizing the system? A few things on the ASD. 1) I’m surprised no one has commented on the timing. Chalkbeat hinted at it with the recent admin that was put in place, but the Supe leaving in Sepetember at the beginning of the school year doesn’t pass the smell test. 2) It’s always funny how lessons learned always seem to be the lessons that should have been obvious during their tenure and always come to late. She talks about the Nashville v. Memphis thing, but I’m not exactly sure what she means. The biggest hurdle in that regard was and still is the ASD central staff largely being located in Nashville. She also talks about engaging families in authentic ways. Well, the community meetings never went well and were always contentious, largely from the ASD takeover strategy. When they revised community engagement with NAC, it was worse and quantifiably so. 3) She makes a good point on the history of communities, which really points to the major flaw in the ASD plan from the beggining which they never really corrected themselves on: They hired leadership from the outside without really looking in. It may have behooved Memphis and the ASD for the Supe to be local. Have you or anyone looked into the WIDA scores or years in MNPS of the STEM Prep Newcomer Academy v. the MNPS SIFE program. Are they serving the “same” students? I assume you’re talking about STEM’s Newcomer Academy here. The issue I have, specifically, is in how they are different. I’m too far removed, but have my thoughts on how. Would love to hear more about it.